They can act responsibly, and pay America's bills or they can act irresponsibly, and put America through another economic crisis," he said. "But they will not collect a ransom in exchange for not crashing the American economy. As you can see, we have more than enough revenue to pay for all of our mandatory spending, including interest on our absurdly high public debt. We have so much revenue, in fact, that we can also pay for a good chunk of the discretionary (read: completely unnecessary) spending as well. And when I call it unnecessary spending, I mean it. When I pressed FreedomWorks staff for the breakdown of the "Welfare and Other Spending" block (in grey in the chart), the reply was that it would take a while to compile a list, because it's comprised of TWENTY TWO HUNDRED FEDERAL PROGRAMS. This includes everything - Department of Energy, Department of Education, EPA and other whole agencies, welfare, unemployment, everything. We can't find ways to cut back our budget at least to the point where we're not incurring new debt? I don't buy it, and neither should you. You don't "pay your bills" by borrowing and running up more bills. 2) My friend Jeff Reynolds may have caused a bit of confusion in suggesting that the entire category labeled "welfare and other spending" is "discretionary." The term "discretionary" can have multiple senses. The spending in that category may be (as I think Jeff argues) "discretionary," in the sense of "optional" or "not necessary." But not all of the spending in that category is "discretionary" in the technical sense of "annually appropriated." 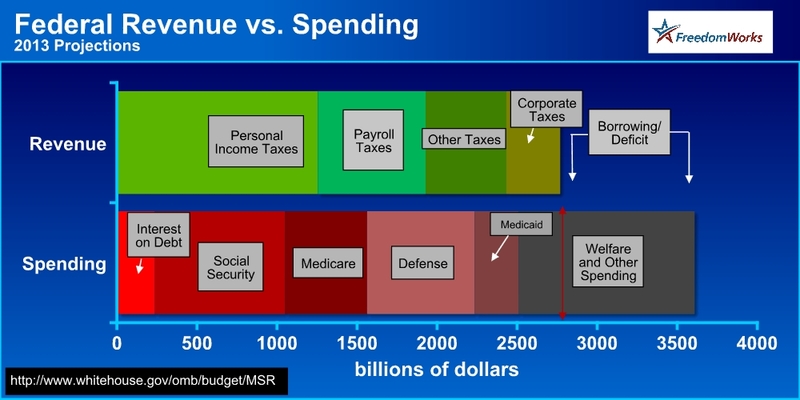 The chart does NOT try to distinguish between "discretionary" (i.e., annually appropriated) spending, vs. "mandatory" (i.e., auto-pilot or entitlement) spending. Rather, what I think the chart shows very powerfully is that President Obama's claim is simply incorrect, that certain kinds of spending (interest on the debt, Social Security checks, etc.) would have to stop being paid in the event the US Treasury hit its statutory debt limit. Even though the Treasury would have to deal with the daily spikes and dips in receipts versus obligations -- no easy task, to be sure -- its power to defer payments until sufficient funds are available would enable it to continue making the aforementioned payments. Funny Ken you should say such a partisan and bigoted assumption Lew....I could say exactly the same thing about the left wing journalism....nothing by lies and deception....now that we did the finger pointing....we can't believe anything BO, the Administration, Congress or Right Wing Media say....You have to use your God given brain to research and sleuth out the facts & TRUTH. Fact is the American people don't really know where any of our taxpayer dollars are going for sure....look at the so called Stimulus Bill fiasco .....Who did BO say was suppose to watch it like a watch dog and make sure the money was going to the right places?....BIDEN....Funny he must not have gotten that memo or had an attack of amnesia and did not realize he was responsibility. Sometimes I wonder if right wing journalists simply assume that nobody ever follows their citations. In fact, the OMB web page at the White House site shows that discretionary spending for non-defense programs is much less than defense spending projected for 2013. The chart displayed here is not at all supported by the citation in the image.